The three concerts that defined the 1960s were Monterey Pop, Woodstock and the Rolling Stones at Altamont. The first one kicked off the Summer of Love in 1967, the second one defined the Hippie movement and the last one ended the hopeful decade on a dark, bittersweet note. It was the Monterey International Pop Festival that arguably best encapsulated the rock ‘n’ roll music that came out of the era and took the world by storm. Famed documentarian D.A. Pennebaker had his cameras there, capturing breakout performances by Jimi Hendrix, Janis Joplin and Otis Redding with additional dynamic performances from the Who, Simon and Garfunkel, the Mamas and the Paps, the Byrds, and several others. 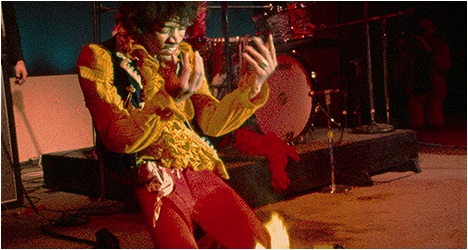 The end result was three classic concert films – Monterey Pop, Jimi Plays Monterey, and Shake! Otis at Monterey – all included in this new Criterion Collection box set. There’s something optimistically hopeful seeing idealistic Hippies gathering for this festival of music. Everyone seems happy and this leads right into the Mamas and the Papas performing their signature song, “California Dreamin’”, which sums up the good vibes that seem to be emanating from everyone. The easy-going vibes of Simon and Garfunkel playing while bathed in a hellish red filter seems like an odd juxtaposition and at odds with their style. Pennebaker tends to favor close-ups so you can really see the emotions expressed by the various music acts. This is evident in Janis Joplin’s blistering performance of “Ball and Chain” that has the famous reaction shot of Mama Cass in awe of Janis who leaves it all out there on the stage in a riveting performance that is a sober reminder that she died way too young. The Who tear it up with a searing rendition of “My Generation” with Pete Townshend unexpectedly smashing his guitar at the end, leaving Keith Moon to go gonzo on his drum to kit to finish things off. Otis Redding brings back the good vibes with “Shake,” a rousing R&B gem that segues into “I’ve Been Loving You,” one his trademark slow burners that sees him give it his all. Like Janis, but in his own unique way, Redding was a charismatic performer that knew how to work a crowd and Pennebaker does an excellent job of capturing it. Then there is Jimi Hendrix who takes it to a whole other level with a feedback-drenched, psychedelic rendition of “Wild Thing” that was a startling revelation at the time as it was so different from what was being done. He even upstages the Who’s act of destruction by lighting his guitar on fire. Jimi Plays Monterey is a documentary about Hendrix that briefly covers his origins with fantastic archival footage of him covering “Sgt. Pepper’s Lonely Hearts Club Band” at the Saville Theatre. Hendrix kicks off his Monterey Pop set with a cover of “Killing Floor” that sets the tone for the rest of the gig, which is shown in its entirety. It is amazing the sounds that he got out of his guitar and this concert is a valuable document of his breakout performance. Shake! Otis at Monterey is his dynamic 20-minute set that showcases what a tremendous talent the man was. There is an energy and a vitality to his performance that is infectious and exciting to watch. This sums up The Complete Monterey Pop Festival box set, which is an invaluable document of a specific moment in time. It is a fascinating snapshot of the ‘60s and a new kind of music that galvanized people at a time when war and social and racial strife were rampant. It makes one nostalgic and wish that there was something that could do that now when we really need it the most. This new 4K restoration features a significant upgrade in image quality and detail as well as visual information. The colors are richer and it sounds amazing! There is an audio commentary by producer Lou Adler and director D.A. Pennebaker with the former talking about how the festival came together and the challenge of getting bands from San Francisco and Los Angeles to appear at the same venue, while the latter talks about how he put the film together and the choices me made. Both men offer their impressions of specific acts, like Janis Joplin, and talk about the predictable nature of the Who’s performance. This is anecdotally-rich track filled with loads of information and insight. There is an interview with Adler who talks about the legacy of Monterey Pop on its 50th anniversary. He talks about what made it so special and how its spirit endures. He also speaks highly of Pennebaker’s work. There is also an interview with Pennebaker. He remarks at how lucky he was to have had the career he has and reminisces about the festival, offering his impressions of various acts, including Janis and Hendrix. Adler and Pennebaker are interviewed in 2001 and talk about the origins of the festival and how Pennebaker got involved. He had never done a concert film before and so it was a learning experience. He had no long-range cameras – hence all the close-ups. Also included are audio interviews with John Phillips, who reminisces about the festival and tells anecdotes about Janis and others. Cass Elliot also chimes in about how great Janis was and agrees with John that they gave a terrible performance. David Crosby talks about what a revelation Hendrix was at the time. Derek Taylor dispels the rumor that the Beatles were there. He talks about some of the acts that couldn’t make it or wouldn’t do it. There is the theatrical and re-release trailers and radio spots. “Festival Ephemera” features Elaine Mayes photographs with optional commentary. She talks about what drew her to photography and recalls how difficult it was because she was up against the stage, which was taller than she was. She also talks about her favorite photos. There is also a copy of the original festival program. MIPFF examines the Foundation that was born out of the festival. CHIEFS is a short film by Pennebaker’s partner Richard Leacock about a convention of police chiefs talking about various things like the Black Panthers and weapons. In addition, there is a whole disc of outtakes exclusive to this box set, featuring performances that didn’t make the cut, including some bands like the Grateful Dead that were cut out entirely. We see Buffalo Springfield minus Neil Young and more of the dynamic blues band the Electric Flag. Alas, only portions of two songs by the Steve Miller Blues Band exist but it does offer us a glimpse of what their set was like. Jimi Plays Monterey features an audio commentary by music critic and historian Charles Shaar Murray. He provides all kinds of biographical details about Hendrix and sets the stage for his performance at Monterey Pop. He provides all kinds of insights into Hendrix’s performance. There is also an interview with Pete Townshend who talks about his impressions of the festival and of Hendrix, including the debate of who would go on first – the Who or Hendrix. There is also a trailer. The Shake! Otis at Monterey disc features a song-by-song commentary by music historian Peter Guralnick. He talks about the energy of Otis’ style and performance in fascinating detail. There is an interview with Otis’ manager Phil Walden who talks about how he got into the music business and what it was like working with Otis.